TULARE – DeLaval Inc. out of Vernon Hills, IL has brought a number of its innovations to the World Ag Expo this year, but the one that is generating perhaps the most buzz is its Teat Spray Robot, which sprays a cow’s teats with a sanitary solution prior to milk extraction. The robot brings consistency, calmness and a routine to the milking process, said Mark Futcher, marketing manager of Automated Milking Systems for DeLaval. “It’s used to pre-treat a cow’s teats with a sanitary solution before milking, and can also be used to post-treat those same teats on the same cow after milking, to ensure a high quality milk and a consistent practice, ultimately reducing the labor component and making our dairy producers more efficient,” Futcher said. Even though the robot seems to be making complicated maneuvers, it is easy to operate, Futcher said, even though some minor maintenance might be necessary after it is set up. The robot can service up to 400 cows per hour, and is completely safe for the animals, and unlike humans, the Teat Spray Robot doesn’t get frustrated or upset. “There’s a displacement of manual labor, but with that comes peace of mind, and consistency and routine that it provides,” Futcher said. DeLaval was founded by Gustaf de Laval in Sweden in 1878 when he invented the cream separator. 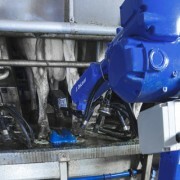 The Teat Spray Robot was introduced to the dairy industry at an event in Germany in November. The robot’s presentation at this year’s World Ag Expo in Tulare is its first showing in North America, and the product should be fully launched next year. Visit DeLaval Inc. on the World Ag Expo show grounds in the Farm Dairy Credit Center in space numbers 6725-30.